Rewriting the rules of Americana, the Lone Bellow are ready for their mainstream moment, working with Aaron Dessner of the National and releasing one of 2015's most anticipated albums. At some point during their 17-show run at South by Southwest 2013 (a grueling schedule, even by SXSW standards), the harmony-rich folk trio the Lone Bellow experienced a collective revelation. "South by Southwest was what we left our jobs for," mandolin player Kanene Pipkin recalls. The band had recorded its self-titled debut LP two and a half years earlier, cobbling money together between a Kickstarter campaign and other sources, and it took that long to settle on "a good label fit, a good management fit, the whole team," lead singer and guitar player Zach Williams says. In the meantime, the three members had been working other jobs: Pipkin as a pastry chef ("She makes a mean Whoopie Pie," Williams attests), Williams as a solo artist, and lead guitarist Brian Elmquist as a songwriter and Brooklyn diner server with "the worst Yelp review of any waiter we know," according to his bandmates, thanks to his proclivity for cutting his jean shorts rather short and thereby showing an aggressive amount of thigh. "The world wasn't ready yet," Elmquist laments. By March 2013, the world beyond the Lone Bellow's Brooklyn community was more than ready to savor the band's distinctive brand of crossover Americana, which blends rousing gospel choruses, bluegrass-inspired finger picking, and electric guitar riffs to create a sound that falls somewhere between Crosby, Stills, Nash & Young, the Staples Singers, and contemporary folk-rock acts like Houndmouth and Deer Tick. One night at South by Southwest, the Lone Bellow played to a packed backyard crowd at the Newport Folk Festival showcase, a crowd that obliviously sipped cans of Lone Star in Blackheart's beer garden while the relatively unknown Lone Bellow set up and tuned. When the band's first three-part harmony soared over its sturdy wall of acoustic sound, heads instantly rotated toward the rundown lean-to that had been converted into a stage. The band captivated the crowd for the duration of its set, even cultivating a group sing-along to the anthem "Carried Away". The experience of being in that crowd felt akin to attending an evangelist revival meeting: everyone was a convert by the end. Following their shows in Austin, the Lone Bellow realized they had just enough money and enough of a following to devote themselves full-time to music, no longer needing to ask their bosses for time off to "go on a radio tour, or to go play Conan," Pipkin remembers. Dropping everything to promote the album "was really scary", according to Williams. "It was like jumping off a cliff a little bit. But we believed in the work we were doing, and we had a lot of encouragement around us, and yeah, it was a beautiful thing." Releasing and promoting their first album was very much a homegrown, collaborative effort, as the band was lucky enough to live in a Brooklyn community of artists and musicians who were happy to lend their talents to the project. From designing posters to laying down instrumental tracks, the bands' friends helped make The Lone Bellow a reality. "On the first record," Williams says, "those are basically all of our neighbors playing." Word about the Lone Bellow started to spread, leading to a "serendipitous" meeting with Aaron Dessner, the singer, producer, and multi-instrumentalist for another Brooklyn-based band, The National. Williams explains how Chris Perriera, the Lone Bellow's tour manager, "read this article with Aaron and Matt [Berninger] in it, and he was like, 'Hey, this guy makes records; I love how he talks about music. I love how he talks about his work and his bandmates. We should reach out to him, see if he'd want to work with us.' So we did, and it turned out [Dessner] lived right across the park from us. "So I think these guys were out of town; I went over there and had coffee with him, and he was like, 'I've had some of my music friends tell me that I should work with you guys.' We were like, 'Weird!'" Williams was floored when Dessner led him into the "tiny garage studio that he made all the National records in. I was just like, 'How did you do that?'" Pipkin and Elmquist were similarly impressed by the tiny space that Dessner had converted into a studio. "He made High Violet in there, in that tiny little garage," Elmquist marvels. "And those drums are huge." All self-professed National fans, the Lone Bellow eagerly took Dessner up on his offer, and the process of shaping their second LP began. 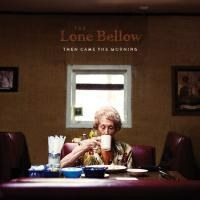 Recently, the Lone Bellow released Then Came the Morning, which retains the musical backbone of their debut -- airtight harmonies, earnestly emotional lyrics, a blend of acoustic and electric instruments -- but builds on that aesthetic in notable ways. Overall, the sonic texture on Then Came the Morning feels more varied than on The Lone Bellow, and the new album dips in and out of even more genres in creating its distinctive style of American roots music. "Telluride", which Williams describes as "a cowboy song", includes a string part written by Pulitzer Prize-winning composer Caroline Shaw, and "Fake Roses" is thick with pedal steel and more assertive, almost Nashville-style percussion. At a recent show in Richmond, the Lone Bellow introduced two additional new songs, the stomping, handclap-laden blues-rock offering "Cold As It Is", and the rockabilly-inflected "Heaven Don't Call Me Home", during which Williams, arms raised, invited the crowd to clap and sing along as though we were in Baptist church. Though it was a seated show in a university auditorium, a few middle-aged fans in the front row stood up and hand-banged along approvingly. "I think because it's two years later, we're a different band altogether," Elmquist reflects. "The same values still come through, but when we made that record we had jobs and we made it real fast. We probably did it in like a week, and we're really proud of it. It did awesome for us. But with this one we could really sit back and really dig in and find the right parts, the right guitars, the right amps." This process wasn't easy though, thanks in part to Dessner's perfectionism. Elmquist recalls, "I sat for days with Aaron in the studio and after, in Brooklyn, just going through it. He made me sit for three hours and play one guitar part; I was kind of losing it. When I lost my mind, I finally played it right, and he finally let me go." The rich, textured sound on Then Came the Morning also stems from the unusual venue in which the band recorded most of the tracks. Dessner suggested that they move their operation from Brooklyn to the Dreamland Recording Studios in Woodstock, New York, a "dilapidated" 19th-century church that was converted into a high-end recording space in the '80s and has since hosted musicians from the B-52s to Joe Jackson. The band speaks rapturously about the experience of working in a space that they describe as a "sanctuary". Williams explains, "There aren't any overdubs with the vocals. We did them all right there, together, so there's a lot of natural bleed, and [Dessner] would mic different parts of the ceiling and the floor, so we'd be singing in the vocal mic but he'd also have these ambient other mics to find the natural bleed of it. And that was really intriguing to me." "I feel like that sanctuary, the church where we made it, really feels like the other main instrument that's on the record. It gives such a huge sound to the vocals, and it's cool because it is the natural sound of three voices together. It's not three isolated voices on three mics singing at three separate times. And also, we'd sing in one part, or another part, and be able to put the guitar in the drum room or wherever. It was so inspiring; I feel like it does kind of make the sound a little bit grand." As grandiose as the sound on Then Came the Morning can get, the Lone Bellow explain that these new songs were inspired by individual stories that they'd culled from their own experiences, their family members' lives, and, perhaps most importantly, from the fans and passing acquaintances whom they'd encountered over two years of almost continuous touring. By the time the band started recording in Woodstock, Williams recalls that he'd written about 40 songs, often starting with an idea for lyrics or a melody and then asking for his bandmates' input on how to develop the song. For example, "Fake Roses" takes the form of a letter from Williams's mother-in-law to her sister. Williams explains, "They have pretty similar lives. And the letter basically says, 'Your heart is breaking, I hear what it's saying. You don't have to tell me anything.' And I was like, 'Well where can we go with that?' Then Kanene brought her own stories and past to it, and was like, 'Here's what that line means to me,' and then Brian and, yeah, so it ebbs and flows that way." Like the bleed between voices that occurs when the Lone Bellow sing in harmony, their songwriting process proceeds in a similarly smooth, collaborative manner, each adding a singular voice to the collective product. It's also clear that the Lone Bellow take input from their fans seriously and listen to what others are willing to share. Elmquist puts it succinctly, "That's what it's about: the stories. Everything is that." After their set at the University of Richmond, a line of audience members waiting to speak with the band wrapped almost the entire way around the Modlin Center for the Performing Arts. In settings like this, the band members have received plenty of feedback about how "Then Came the Morning" relates to or captures experiences from their fans' own lives. Referring to the photograph on the album cover, taken by Mackenzie Rollins in Williams's parents' favorite diner in Marietta, GA, Pipkin reflects, "It's a picture of an elderly woman, just sitting alone at a diner drinking coffee. And to me, I feel like when you're playing music, when you have three people singing together, it can feel real intense, and I think even the title, Then Came the Morning, can feel really grandiose. "But when I saw that picture of this woman, just drinking coffee by herself, it was poignant to me, because I was like, 'Then Came the Morning' could be as small and simple a hope as just choosing to get up in the morning and live your life. And who knows what that means for each individual? And already the stories we've had from people who've responded to this song have been incredibly inspiring and heartbreaking and beautiful. "I think this album kind of holds the weight of learning to trust each other and learning to hear all these stories we hear on the road. And honor the people who are telling them, and who choose to become part of our band by listening and by sharing their life with us. So I see it as a really hopeful record. Not in terms of thinking, 'Everything's going to be okay right now,' but small increments of hope. I just love that picture. Because you don't know what that lady's been through."